Stuff that really makes you smile when you find it by luck, as you're going about your day? Do you rummage through car boot sales, second hand shops and garage sales with a mental list of what you wish you may serendipitously discover, by having just one last look...in one last corner...with *fingers crossed* just one last time!? 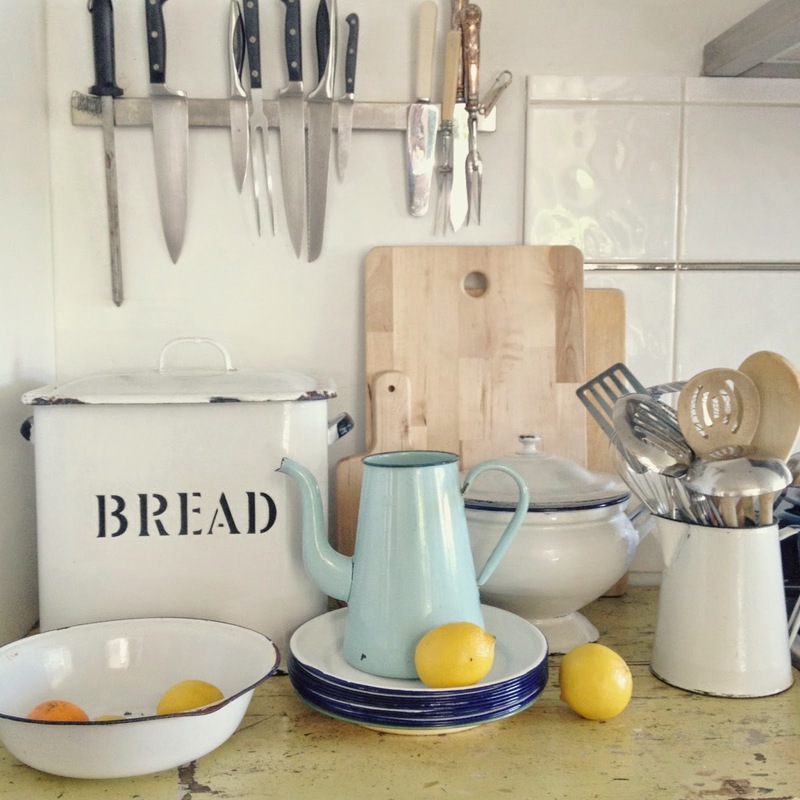 Enamel ware comes in all shapes, sizes and colours, so you really need to have your wits about you! What can look ceramic from a distance, may actually be a simple, unusual piece of enamel ware. See that soup tureen below- case in point! 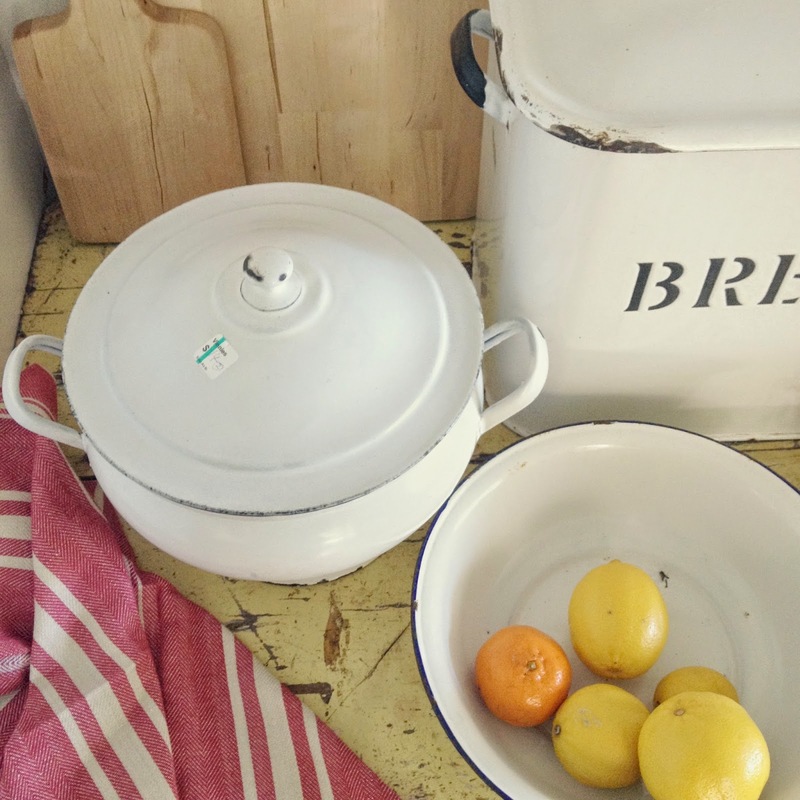 I've collected a pretty fab stash of enamel ware over the years- especially on our travels whilst living in the countryside of England. I discovered that English fishing shops hold huge secret corners of camping and cooking enamel ware! I discovered that English bread bins can be found in friends garages full of junk! I discovered that enamel French coffee pots, with no lids, sell for next to nothing in back street country brocantes! My searching in Australia has also been pretty good so far. Yesterday I finally hit, for me, the enamel jack pot! A gorgeous morning wandering with three special girlfriends, through secondhand shops, coffee in hand, we celebrated a 40th birthday. A second hand, vintage searching morning for a 40th. 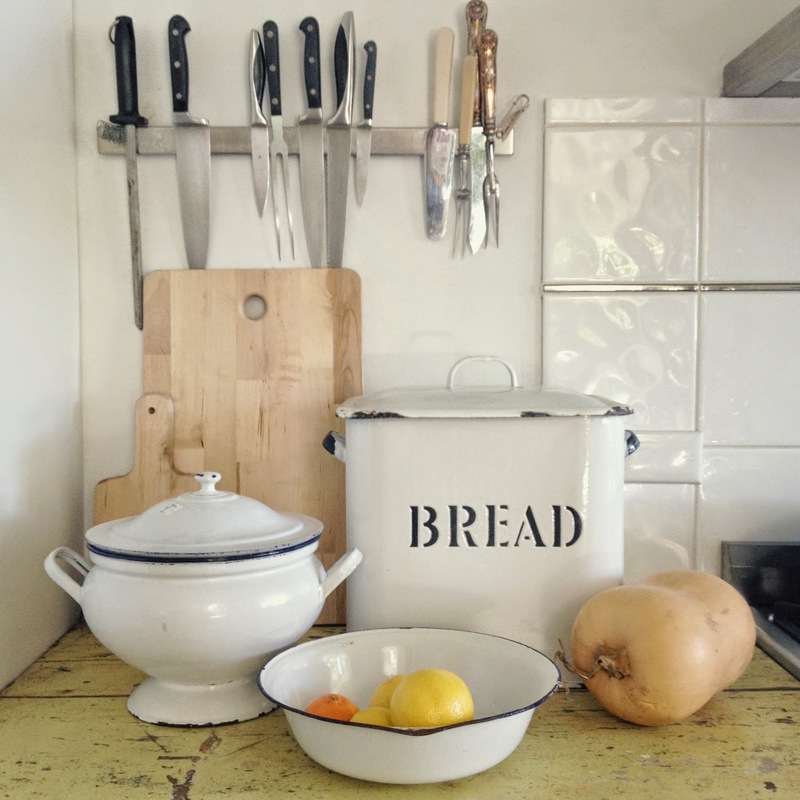 Anyway...that there ceramic-looking-but-actually-enamel-ware soup pot was my morning jack pot! Yeah- we got cool vintage clothes...and handbags...and a sweet-as little country paddock painting...but the jack pot was this pot. My girlfriends did not bat an eyelid at my happiness. True girlfriends are like that. My wonderful Swedish girlfriend even remarked that *a collection is a lovely thing to have in mind when wandering around isn't it*...she's sooo smart! That's not too many coffee's in Sydney- like 3 1/2 if you're lucky! Two heavenly on-line stores that I know you will get lost in, can help you out with that. Both divine and time consuming. Take a coffee to the sofa with that shopping hour! 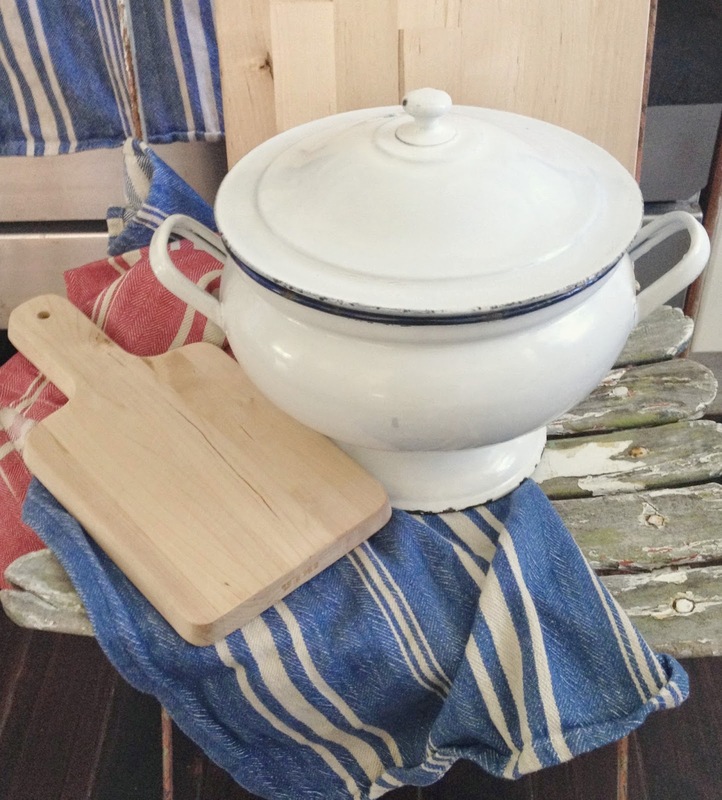 Melissa, I collect the gren and cream enamel ware and was lucky enough to be offered a full flour to coffee set, including sago, many years ago for virtually nothing. A couple of weeks ago, on my way to Albury, I stumbled across a colander for very little at Gundagai. The hunt and the find is so much fun. PS I saw a pale yellow coffee pot just like the pale blue one in your top photo in Paris, am still kicking myself for not buying it! !